Boil the grated lauki with water for 3-5 minutes. Remove the excess water and let it cool. Crush the garlic in a pestle and keep aside. In a bowl take curd, add the cooked lauki and salt to it. Mix it and keep aside. In a pan heat oil. Add the mustard seeds and cumin, once they splutter add the curry leaves and crushed garlic. Mix it and add the finely chopped onion. Cook till the onion becomes translucent. Add the cooked onion to the curd and mix it properly. Serve sprinkling cumin powder on it. 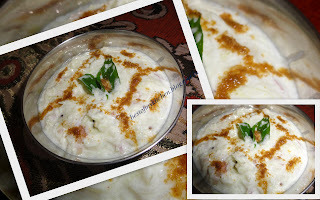 nice and very refresshing raita..